Fireworks and hongbaos are in the air – Chinese New Year, and the Year of the Pig, are almost here. Judge us if you like, but when we realized what year it was our first thought was all the tasty ways we can enjoy our porcine friends – and what wine would be the best to match. 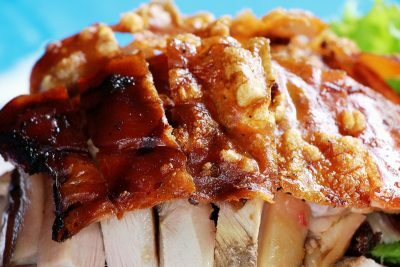 Everyone’s favorite sandwich-filler is maybe the most versatile and most popular of pork treats, and for good reason. 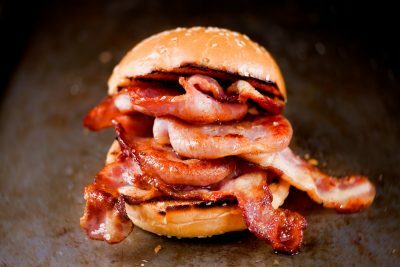 It can go in anything – from a BLT to a burger to an English breakfast – so the best way to pair it with a wine is to zero in on what makes it so delectable. The dry freshness of a good rosé creates a great contrast with the smoky, salty tones of bacon. Sparkling works well too – a fizzy rosé, then, is maybe even better. Roasted pork belly is the guilty-pleasure indulgence that you didn’t know you needed, with just the right amount of respectable class. 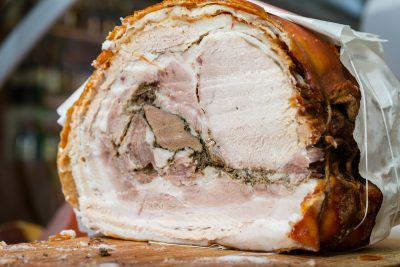 When done right, like in a well-cooked porchetta, it’s incredibly, you-can-cut-it-with-a-spoon delicious – meat as a substitute for butter. We recommend a red with a bit of heft. Rioja should work well, relatively light and fruity but with enough tannins to stand up to that richness. 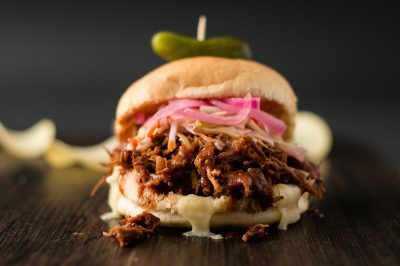 If there’s one thing we can truly be thankful to America for, its pulled pork sliders. Or just pulled pork in general. 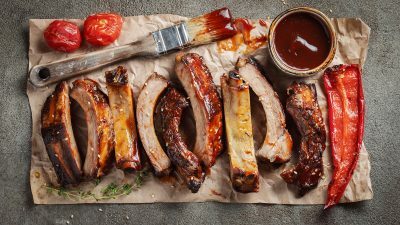 This tender, sticky BBQ staple is God’s gift to carnivores, and demands a wine that matches that big bold character with crisp acidity, medium tannins and just the right amount of fruitiness. A Pinot Noir does the trick magically. Carmenère wines are rich, and fruity with just the right hint of depth and complexity. They’re rich and textured, just like a great plate of pork ribs. That makes them a pretty perfect match. The hints of smokiness in a Carmenère that complements the charred, meaty flavors of a grilled or barbecued pork ribs, too. Suckling Pig – big, extravagant, and a meal that is truly an occasion. Comfort food turned up to 11. You need a luxurious wine to match, and a complex red blend from France’s Côtes du Rhône will do the job. A happy coincidence, a suckling pig can also pair with the Viognier-centric white wine blends typical of the Rhône valley too, that often pack a balanced sweetness that will cut right through crispy skin and smooth fat. If you’re kicking off an evening with a classic charcuterie board, do it Italian-style and go for a classic aperitivo tipple. We’re thinking a Prosecco. 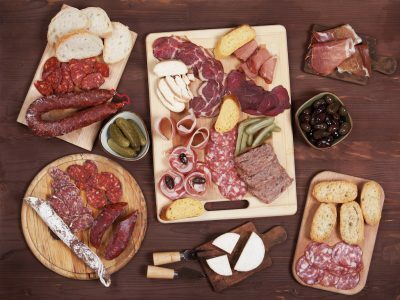 While a wide array of meats might make you reach for the red, fine bubbles and an off-dry sweetness can do wonders for working through the delectable grease and fattiness of the best salami, prosciutto or jamon. They do say Italians do it better. 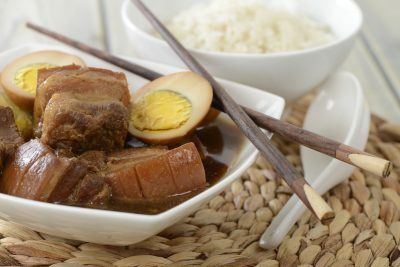 Hongshaorou (or ‘red braised pork’) is a staple of Chinese cuisine, something you’ll find in restaurants of various cuisines, but pairing these it with wine is tough. You not only have the rich fattiness of pork belly chunks but the intense, sticky, soy-inflected sauce they arrive in to contend with. A lightly naked Chardonnay can possess the buttery body to neutralize the fat and cut through the sweetness in the sauce. 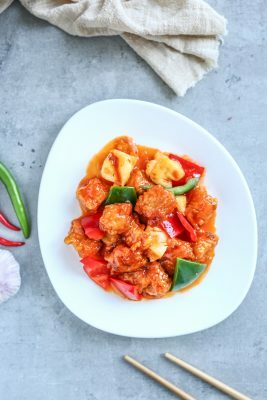 Riesling is suggested as the ideal wine for pairing with Chinese food so often that its almost a cliche at some point – but when it comes to finding a partner for Sweet & Sour Pork, this cliche has a lot of truth to it. The crispness of an off-dry German Riesling can cut through the unique clash of flavors in this deliciously uncompromising dish. 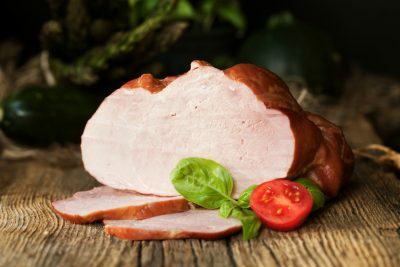 Compared to some of the other dishes on this list, a roasted ham has a pretty simple flavor profile. This Thanksgiving staple goes great with that most American of wines – Zinfandel. The fruitiness of this New World favorite blends beautifully with the light flavors of the ham as well as a decadent honey glaze. As a signature dish on festive American dinner tables, this is something of a seasonal dish in Shanghai. Watch out for Thanksgiving and Christmas set dinners at your favorite American spot come the end of the year to try out this pairing. Feel like induling in a little year end pork pairing of your own? 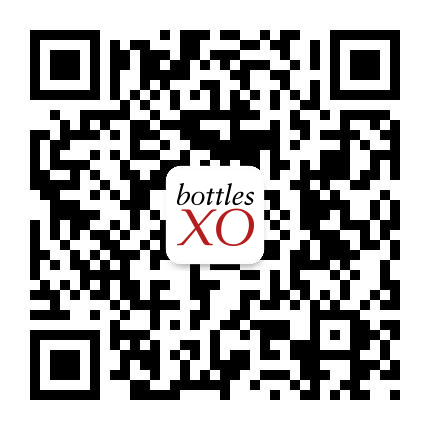 The wines mentioned above and more are available now for instant delivery on the BottlesXO app in Shanghai and Suzhou. Click here to download the app and start ordering.